It seems I often find myself at my computer late at night, just starting to compose a blog post long after a reasonable person would have gone to bed. Part of this is due to not having to be up at a set time in the morning (for instance, to go in to the office), so I don’t feel the pressure to keep to a strict schedule in the evenings. The other part of it is that some cosmic process conspires to prevent me from starting any earlier. I went back up to Ottawa to take my sister to sign the paperwork for that car, and through one thing and another ended up leaving the city later than intended. And on the way home, it started snowing. Hard. Such that I was reduced to half the speed I would ordinarily drive on a clear night (it didn’t seem to phaze the locals, however, who breezed by me in their sporty Mazdas and hefty F150s. Part of me hoped they’d get home safely, but the other part of me hoped for the gratification of seeing their taillights in the ditch a few miles up the road). When I got home the one show I watch every week was just starting, and then my Mom called not too long after that. And, well, time just slowly slips away. So all that is a very long-winded way of saying that I had planned a longer post for today, but will delay it in favour of a shorter Today post (would you believe that my university professors criticized me of being too succinct in my term papers?). 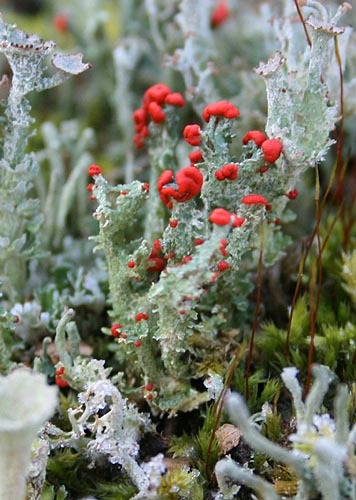 Today’s subject is British Soldier lichen, Cladonia cristatella. My sister spotted this patch growing on a stump to the side of the trail. A week or two ago I wrote about Pixie Cup lichen that I found while hiking with Dan and Raven in Frontenac Provincial Park. While looking up the ID for the Pixie Cups, I ran across a few mentions of British Soldier lichen, a member of the same genus as and therefore closely related to the Pixie Cups. It has very distinctive bright red caps, thought to resemble the caps of the British soldiers during the American Revolutionary War in the late 1700s. It’s a relatively common lichen, so it’s somewhat funny that I hadn’t run across it before, especially since you would think the bright red caps would draw one’s attention. However, at least I already knew what they were when we found this patch. 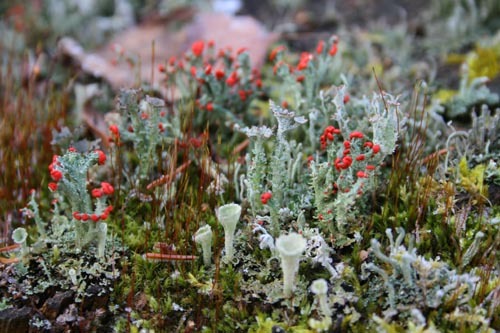 Because lichen are a symbiosis of a fungus and an alga, the red caps are actually the fungus’ fruiting structure. The structure is similar to those employed morels and some other mushrooms, although they aren’t related. It takes a lichen anywhere from 4-8 years to reach sexual maturity and begin to reproduce, so up to that point the British Soldiers would remain capless. While the ones down here may not grow quite so old, lichens growing in the tundra of the far north can reach incredible ages, some anywhere from 1000 to 4500 years. They can survive this long because they are drought-resistant (the tundra is technically a desert, after all) and very hardy. Consider that the oldest of these may have started growing back when the Great Pyramids of Egypt were being constructed, and that really puts that 4500 in perspective. Generally, though, the lichens that grow in our temperate part of the world tend to have the same sort of lifespans as the trees in the forests. Does their symbiotic makeup contribute to their longevity? As in, one small part might die but other parts keep on, and so the whole blended mat remains alive? What an interesting find. I have never noticed these on my journeys. Very scenic lichen … and I like their common name. A pink, brown, or wine colored dye can be produced from a lichen known as British soldiers. great for cotton or silk fabric.